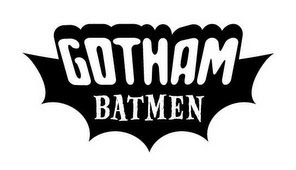 A divided Board panel sustained this opposition to registration of the mark GOTHAM BATMEN, in standard and design form (shown below), for "general business networking referral services, namely, promoting the goods and services of others by passing business leads and referrals among group members" and for "entertainment in the nature of amateur softball games." The panel majority found the marks confusingly similar to the registered mark BATMAN, deemed famous for comic books and movies. Applicant's parody claim went, as usual, nowhere before the Board. DC Comics v. Gotham City Networking, Inc., Opposition No. 91194716 (July 17, 2015) [not precedential]. This post shall not recapitulate the evidence of fame. The panel majority found that the fame of the BATMAN mark "is transferred to a vast array of collateral or merchandising products that are purchased because they bear the BATMAN trademark." In other words, "consumers have come to associate the fame of BATMAN with the products bearing that mark." [Huh? So BATMAN is famous for every product that bears the mark? - ed.]. Once the BATMAN mark was accorded that scope and strength, it was three strikes and out for applicant. Because Opposer’s BATMAN mark is famous and it has been licensed for use on a myriad of products, countless individuals have been exposed to Opposer’s BATMAN mark and to its use on or in connection with collateral products, including t-shirts and baseball balls and bats. Under these circumstances, individuals familiar with Opposer’s BATMAN marks and their associated goods and services, when confronted with Applicant’s mark in connection with softball games and networking services, will consider such activities to be sponsored by or affiliated with Opposer. With little or no discussion, the majority also deemed Opposer's "batwing" logo to be famous. The addition of GOTHAM to BATMEN does not distinguish the marks, said the panel majority, since it is "undisputable" that the superhero is known to hang out in a place called Gotham. Furthermore, any aural dissimilarity would be outweighed by "the recognition of that fact by those familiar with opposer's marks." Parody? Fuggeddaboutit. "The right of the public to use words in the English language in a humorous and parodic manner does not extend to such words as trademark if such use is likely to cause confusion." [Kind of begs the question, doesn't it? - ed.]. Moreover, it is not Opposer's BATMAN marks that are the target of the parody but Applicant's own members (i.e., the superiority of their softball and networking prowess). The parody is an inside Joker. [But applicant wasn't laughing - ed.]. And so the Board sustained the opposition under Section 2(d). Dissent: Judge Taylor dissented, contending that Opposer had not met its burden to prove fame. She would find that the BATMAN marks are not famous and, because the gods and services of the parties are so different, that confusion is not likely, or at least that Opposer did not prove that confusion is likely. TTABlog comment: I subscribe to the theory that some marks are so famous that the likelihood of confusion is diminished, the public not being completely gullible, but able to recognize an obvious parody. John - your post today made my day! It is a very rare occurrence when the phrase "begs the question" is used properly! I learned the hard way after my father (a snoot) read an article I wrote that was published in a national law journal. It served me right for not having him proofread it first! Thanks! My first thought is that this should be appealed to a court which is less myopic than the TTAB on these matters. After more thought, the decision makes more sense if construed to only affect registration rights. My opinion is that I can live with the rejection of the registration, but this should clearly not be actionable in any way as an infringement. Not sure on what product I could hear the term "Batman" and not think of the comic book character. As for the parody, makes me more than tired when people can't come up with their own brand name and need to trade off of someone else's name or logo to start a business. What section of the Lanham Act is that defense set out? I can somewhat understand how it got into copyright law, but there isn't any correlation between the two when you are talking about using someone else's name to create a brand. Thank you Board for getting rid of that effort to import that into registration practice. I agree with TMBaron that I think the decision is sound for refusing registration, as opposed to use, but I think the grounds should be because of a lack of fair use. I have been processing yesterday's and today's posts about how the Board doesn't seem to recognize parody as perhaps being a reasonable policy of the Board because by definition if one is trying to register a mark, the use of the parodic expression is intended to be commercial. As such, the Board is correct to not recognize parody and fair use because those are defenses to USE a mark and not justifications for registration. I agree with the disagreement here that there is a likelihood of confusion. Section 2(a) false association sounds better than likelihood of confusion here. My first thought was "HOLY S#&T Batman, Judge Taylor has Gotham be kidding me!! Batman NOT FAMOUS??!! ZONK!" Of course it is famous! It's been a cultural icon for 75+ years, appeals to every age group, is still probably the most popular Halloween costume for very young children and up and the movies, characters and merchandise are as popular today than they were 50 years ago. There are few truly transcendent, generational entertainment brands in the global sense and without a dark shadow of doubt BATMAN is one of them.. which begs the question, is Judge Taylor Batman? I think parody could be considered under the 13th (catch-all) du Pont factor.